“can the classroom be a place for evangelization? The previous posts in Theological Shark Week III all shed light on different aspects of this important question. For those of us teaching core (required) theology classes in American Catholic colleges and universities, this is also a complicated question. Coincidentally, our theme coincides with the lead article of America Magazine this week by Matt Emerson who offers an insightful reflection on this question in Catholic high schools. Last week, I began teaching my first theology class to undergraduate students. The course, entitled Exploring Catholicism, aims to investigate the depth and breadth of the Roman Catholic tradition. Even though it is a yearlong course, it almost seems impossible to cover such a tradition in a short amount of time. On the first day, I distributed a small questionnaire to each of the students to gauge their experiences with Catholicism, their hopes for the class and to see if they had any specific needs. As I was reading the brief responses I discovered that only a third of the students identified themselves as Mass-going Catholics. Several of these students had gone to a Catholic high school. Another third identified themselves as having been baptized, but no longer practicing. And the final set of students reported no experience with Catholicism at all. Such a diversity of experience makes designing and teaching a class about Catholicism somewhat challenging. As I soon found out, I could not assume that all the students (even the Catholic ones!) understood basic terms or ideas about the faith (“Creed,” “Eucharist,” “Incarnation”). This reality of pluralism is something that many of the “prophets of doom” of Catholic higher education (i.e., members of the Cardinal Newman Association) simply do not understand. We no longer live in the 1950s! And we must avoid romanticizing that unique and very imperfect historical period. Our Catholic colleges and institutions are no longer exclusively populated by young Catholic men and women with a dozen years of formal Catholic education before college. This is simply no longer the reality. In fact, on average, only 65% of students at Catholic colleges identify themselves as Catholic. Yes, we need to be concerned about Catholic identity and faith formation, but Catholic colleges can only do so much given the dismal state of catechesis, the struggles of the Catholic media, and the absence of dynamic Catholic associational/apostolic milieu. While challenging, the reality of pluralism offers new opportunities for Catholic higher education, scholarship, and research. It also offers new opportunities for “evangelization.” For example, in my undergraduate class, some students indicated that they chose my class “Exploring Catholicism” to learn about their own faith that they knew little about (reflecting the poor state of catechesis). One student, who identified herself as non-Catholic, said she wanted to learn more about the religion of her grandparents. Given the challenge and opportunity of diversity, what then should be the relationship between theological education and evangelization? Inadequate preparation in parish formation does not, of course, reduce the university classroom to catechesis…We are in a university. I am asking them to think, and…yes, this will be on the test. They have to master concepts. I tell them I do not demand that they believe anything of course. And I mean it. But, like any good professor, I strive to present the material in the most compelling manner that I can. As a theologian and professor, however, I do hope that my students will find the material and the Mystery behind it as compelling as I do. I also hope that as a teacher that I can, as Pope John Paul II urged in Ex Corde Ecclesiae, witness to an “authentic Christian life, which evidences attained integration between faith and life, and between professional competence and Christian wisdom.” (22). Students, themselves, also witness to Christ to their peers and I hope that my classroom enables this to happen. But the classroom can only do so much. The university, the church, and the life of the student are much bigger than the theology classroom. The real evangelization on the university campus happens on campus ministry service trips, in prayer groups, in student liturgies, and in late-night discussions in the dorm. 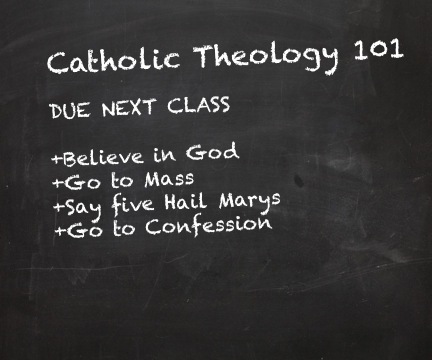 The theology class can help give content to these experiences and get the mind going. The Christian professor can help model an integrated Christian life. But this is not enough. Student evangelization demands the support of vibrant Catholic student communities and campus ministries aimed at addressing the integral nature of the student. Unfortunately, while we pay a lot of attention debating how theology professors teach, we largely ignore a deeper problem, the absence of strong Catholic student/young adult communities and the need for dynamic catechesis. Note that the theme of this Shark Week will be addressed at the College Theology Society annual meeting next year (May 30 – June 2) at Creighton University in Omaha, Nebraska with the theme Teaching Theology and Handing on the Faith: Challenges and Convergences. ← Faith!? You Can’t Teach Faith!